The Zulus are the largest tribe in South Africa, renowned for their basketry, artistry and craftsmanship. Many women make beautiful baskets using traditional art forms in order to supplement their incomes. For many this is their only means of support. Women work in their homes, assimilating basket weaving into their normal routines permitting them to raise their children, work in the fields, collect water or do other daily chores. 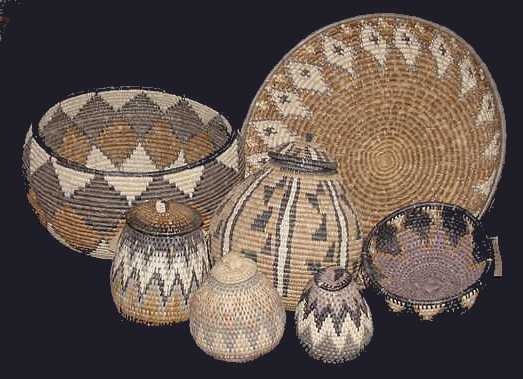 Indigenous raw materials are used in making these hand-woven baskets. It can take up to a month to produce a medium-sized basket with its own unique size, shape and design. Each piece is a true collector's item. Each of these baskets is one of a kind and you will receive the piece pictured. After you place a basket in your shopping cart, it will be removed from inventory. If you look in your shopping basket (link at the top "basket contents"), you should see it there. Please use the links on the left to view our selection of these handmade baskets. *These symbols are often combined for family baskets. Frequently each family member will have their own basket. Family baskets are commonly used to store dried goods (i.e., nuts, beans, herbs, etc.). Black (Omniyama) Palm leaves are first precolored in river mud and then boiled for 8 hours in a leaf and water mixture from the Umbuque tree. Lilac (Ubukhwebezane) Palm leaves are boiled in a mixture of crushed shrub leaves and water. Pale Red (Bomvu) Palm leaves are boiled for 2 days in a mixture of crushed Tal shrub leaves and water.